This is a great reference app for professionals and individuals alike. Whether you work with Rolex in retail or in the buying and selling of second hand merchandise, or whether you are simply a Rolex fan, this is a must-have app! 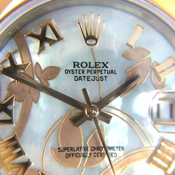 The first is a guide to help you estimate the age of a Rolex based on it's Serial Number. Many of the models will look the same over the years, therefore, knowing how the Serial Number translates to an approximation of the age of the timepiece which is invaluable when buying or selling. The second is a guide of the evolution of price for certain Rolex models over the years, from the early 1970's until today. This is based on Rolex's US price increases which it consistently has every few years. How much did you client pay for his steel and gold Submariner back in 1985 when he purchased it? This is important information to have when you are negotiating a purchase or a trade in at your store. The third section is a guide which details the years of introduction of certain models and other Rolex inventions or additions to their collection. This includes year of introduction for the Oyster Bracelet, for the Parachrom Hairspring, for 904L Steel, the Explorer II, the Oyster Case, and much more. After years of working with Rolex and using this information daily, it is great to finally be able to have it in your pocket and easily accessible everywhere you go!